Another Dental Implants happy patient review in Cancun! You are here: Home / Blog / Cosmetic Dentistry / Another Dental Implants happy patient review! 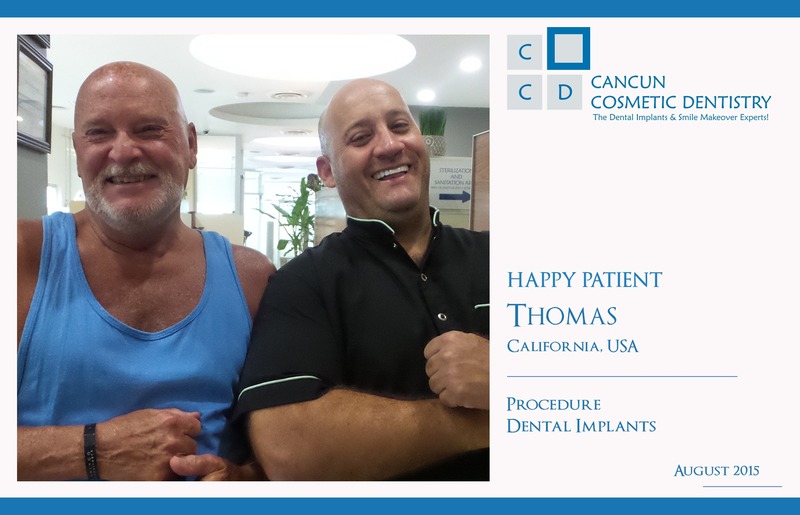 We would love to thank our dear patient Thomas for his preference. Thomas came from California with his beautiful wife Robin for an amazing dental vacation in Cancun. He decided to get a couple of titanium dental implants to help him eat better. He’s pictured above with our head dentist, Doctor German Arzate. Dental implants can be used to restore looks on your smile and also restore functionality to that part of your mouth. 178 million people in the USA only are missing at least one tooth. They could have lost them for trauma, gum disease or cavities. Your missing teeth could be affecting the way you eat provoking nutritional changes, obesity, diabetes, coronary artery disease, teeth shifting and bone loss. When you get a new implant, that device will stimulate your surrounding bone, preventing further bone loss in that area. Thomas and his wife had made research back home looking for dental implant options with their dentists only to find out that they would be charged at least $2500 only for the implant not including abutment and crown! Our dental implants are cheaper than that but in no way the quality is compromised. We use Grade 5 titanium implants approved by the FDA, the same implants they would use on United States and Canada. Our facilities are top notch and our staff is always there to help you on every step of the way, including follow up. You are important to us and our priority is your well being. Come to sunny Cancun during your vacations and you will completely fall in love with our Caribbean beaches! Great service at a great price! We will tell all our friends! Thank you so much for placing your trust on us Thomas! We will see you later! Get rid of dental stains on Cancun Cosmetic Dentistry! An All on 6 dental implant patient reviews our work! Shocking Link Between Hormonal Changes And Gum Disease!